Aweeee. 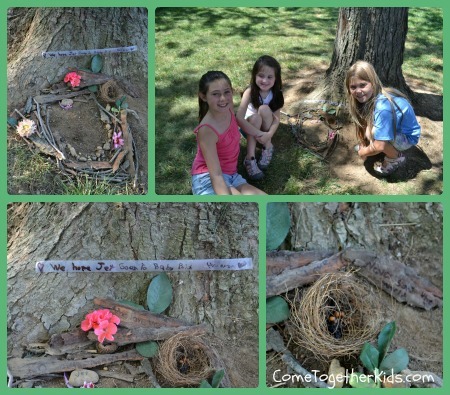 What sweet kiddos, and this bird was so blessed by such a loving Memorial! Super Sweet Post! Loved it! That truly is sweet and beautiful. that *is* so precious! what sweet, compassionate kiddos. Aw, have you ever heard of "The Dead Bird Book" by Margaret Wise Brown? (It is lesser known to her Good Night Moon)-this reminds me of that book! i am recovering a tattoo on my upper and i require ideas..i was considering getting a wind toll blowing in the twist, possibly a few mists above it with a cross sitting on them and perhaps like a cool fledgling sitting on the wind chime..but i likewise truly enjoyed this hear molded jewelry with her name in the heart like a memento and i truly preferred that and i like blossoms however i don't need it to be too enormous and i can't generally assemble it in my head..i need to keep it kinda straightforward and i am pondering laying out it in the blacklight uv ink..can anyone help me piece it together? much appreciated! Very nice post with interesting title.Thanks for share. Interested in mobile app choose best mobile app development services . Thanks for your impotent and nice post. We are create a web site and here we prov aid PSC Result related any update information. Like as, PSC Result 2017 Check by SMS, PSC Result Check Online, PSC Result Check, PSC Result Publish Date related any update information. Thanks, its awesoem. well written. Play free online Mini Friv Oyunlar for gamers.